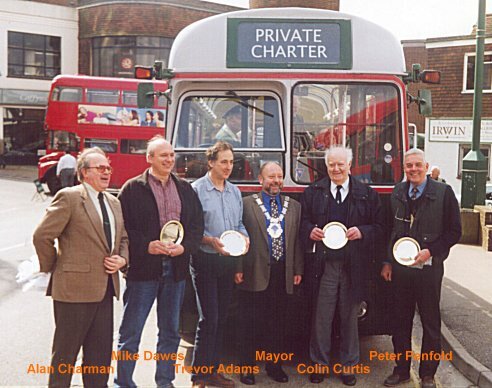 RF4 and RF13 were there representing the class, with some of the owners: Peter Penfold (RF4, RF20), Colin Curtis (RF19), Trevor Adams (RF13), and Mike Dawes (RF12, RF16). 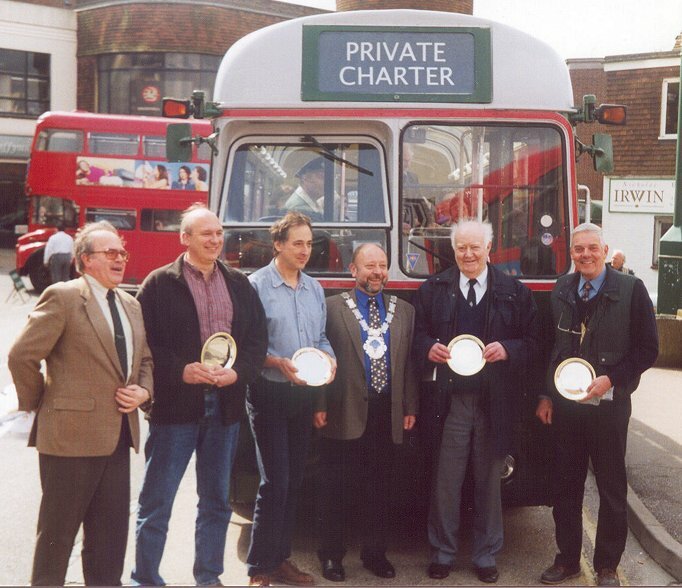 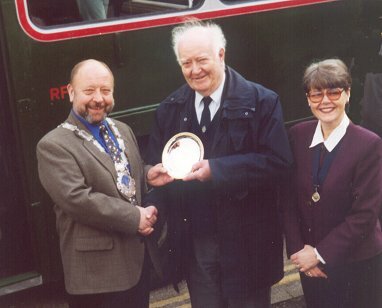 Alan Charman had arranged for the Mayor of East Grinstead to make presentations, and the owners and the Mayor clustered around RF4 for the speeches and presentations. 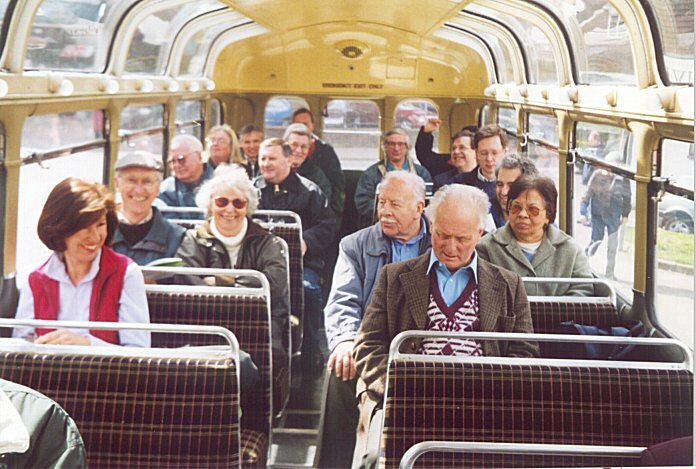 RF4 itself was filling up with an invited party for a tour. 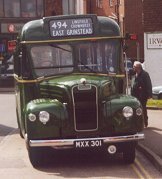 After that the day's services kicked off with a vengeance (There had been earlier services, mainly feeding in towards East Grinstead, such as GS1 on the 494 from Oxted (after a 465 Westerham trip)). 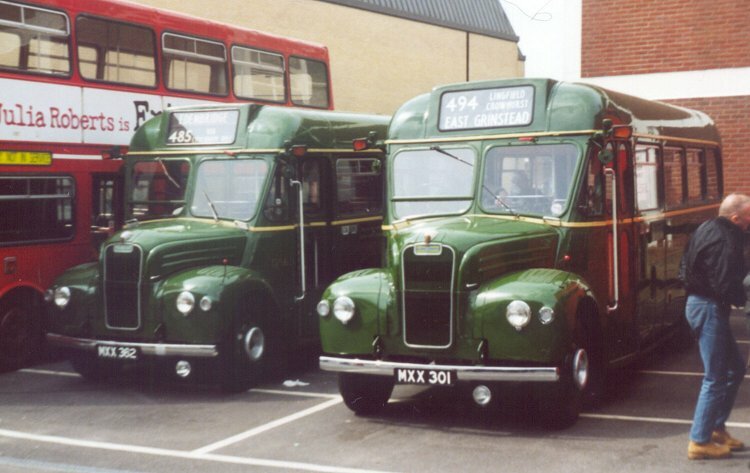 RF4 departed and the buses started to filter out onto the stand. 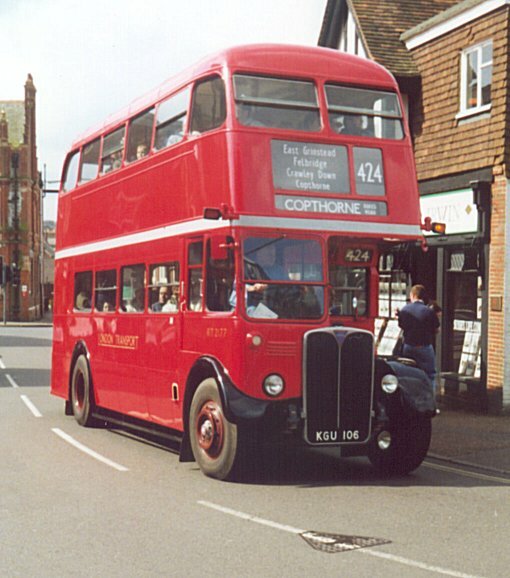 RF 633 headed for Edenbridge on the 434 service, and RT604 headed for Dormansland on the 409. 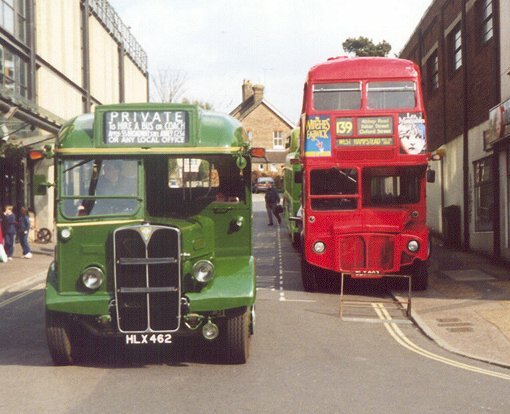 Some service buses had been unable to attend because of foot and mouth restrictions, and some surprises filled in. 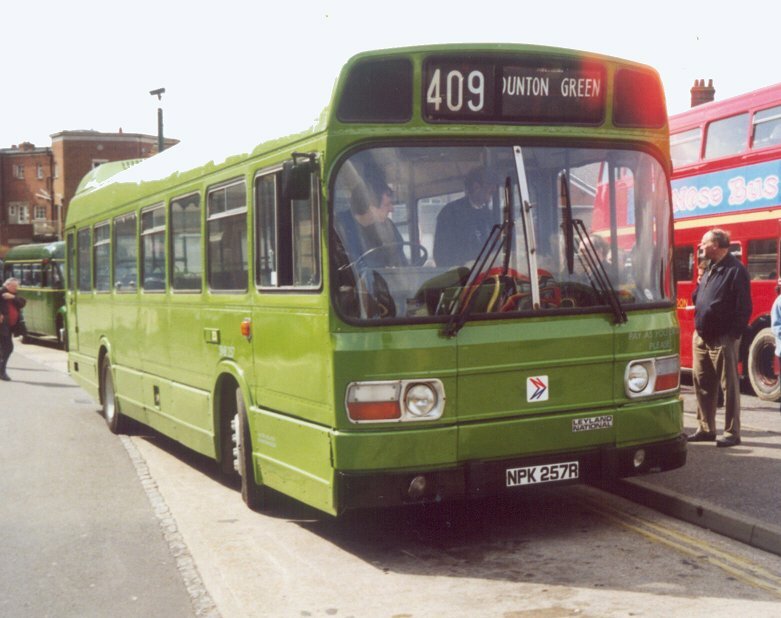 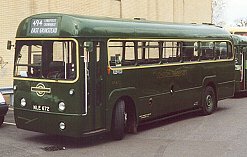 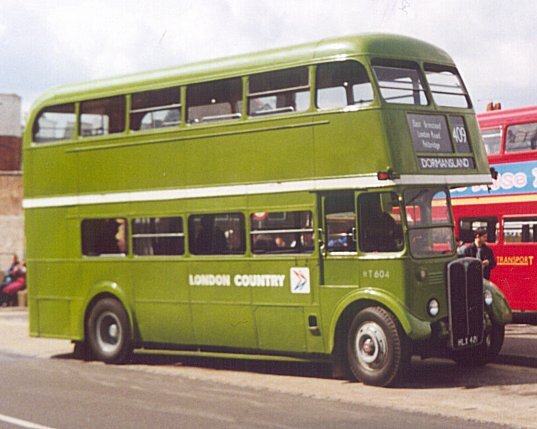 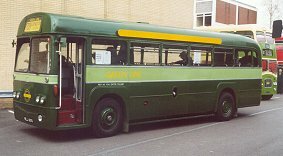 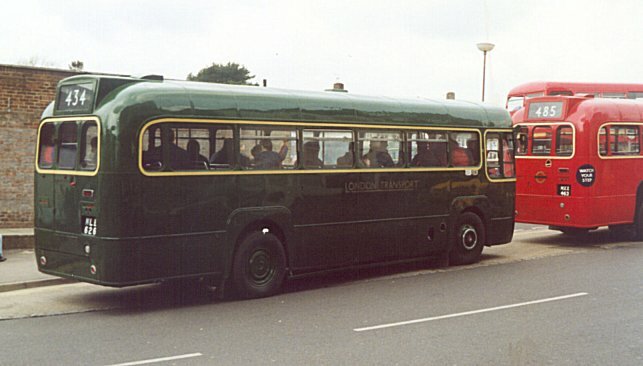 SNB257, repainted into London Country green from its previous Northumbria dazzle camouflage was also on the 409 (albeit with a Dunton Green blind, dating back to its days there). 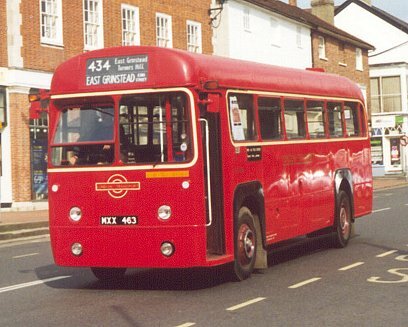 Red RT 2177 passed through on a 424 (Stone Quarry Estate to Copthorne), reminding us that the Country Area frequently borrowed red RTs on summer Sundays, their busiest day of the week before the widespread use of motor cars. 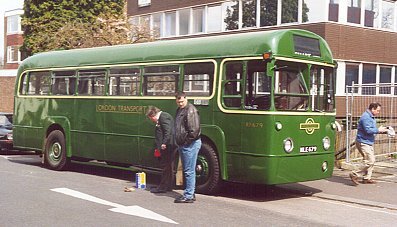 Mike Dawes asked me if I would like to conduct (navigate) for Ray aboard RF255, which was due out shortly on a 708 tour So we set off to retrieve the blue and yellow coach from the bus park. 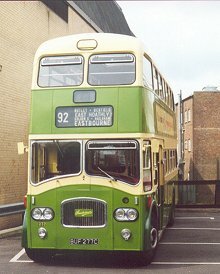 We had to wait to turn while GS2, in sparkling Southern Motorways livery, pirouetted first. 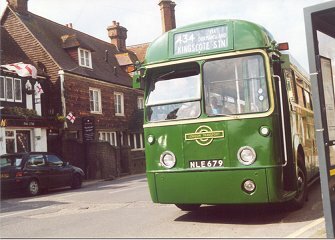 We were out on the stand on time, and were soon carrying a good load of passengers out to the north-west, out via Felbridge and round through Lingfield and Baldwins Hill back to East Grinstead, linking together the two traditional Green Line approaches to the Sussex border town. 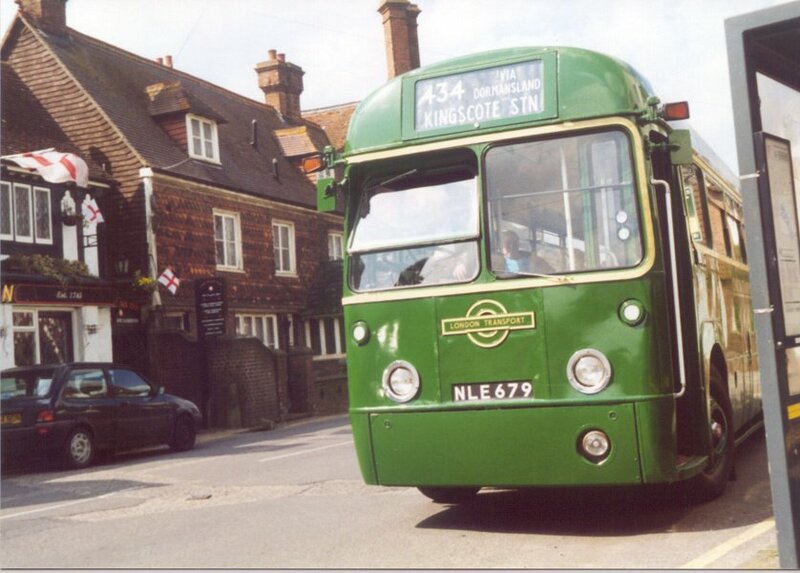 On the way back we passed green RF679, working out to Oxted Station. 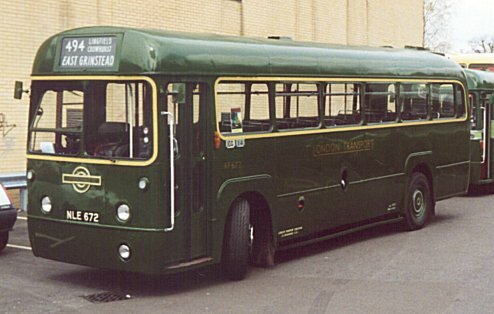 With the passengers discharged RF255 was due a break before an afternoon of touring based at Sheffield Park, and was parked at the deep end of the bus park. 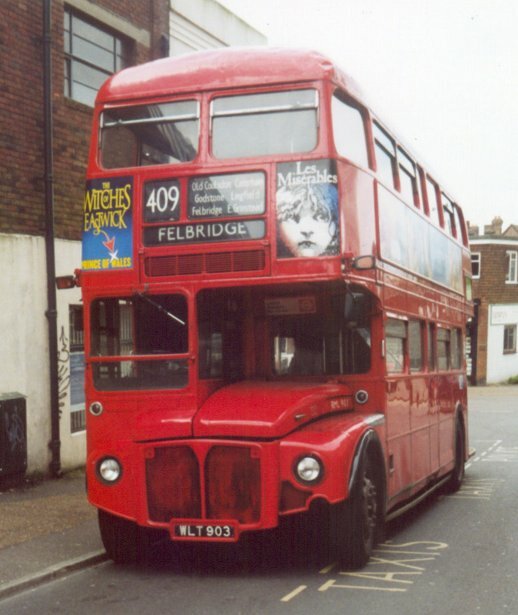 This gave me another opportunity to see what was there now. 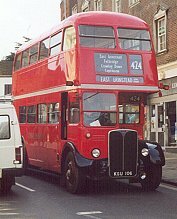 GS62 had changed partners. These little Guy Specials tend to cluster together in the spring, and it was GS1 now parked alongside in place of GS32. 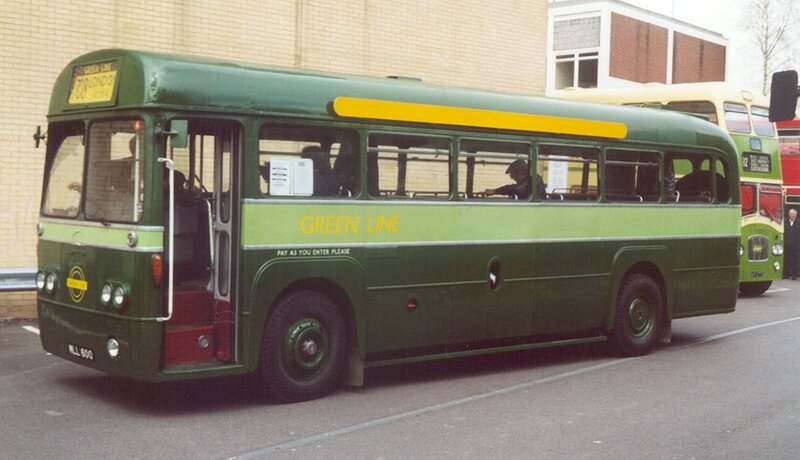 Modernised Greenline RF213 was also there, sparkling in the sunshine, wearing 708 blinds ready for its turn on the tour. 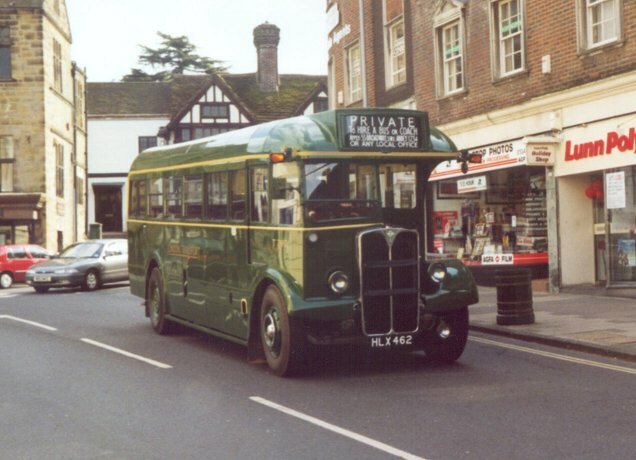 East Grinstead was a border town between London Transport, Maidstone and District and Southdown, and the last of these was represented during the day by "Queen Mary" PD3 No.277, which operated short turns on the 92. 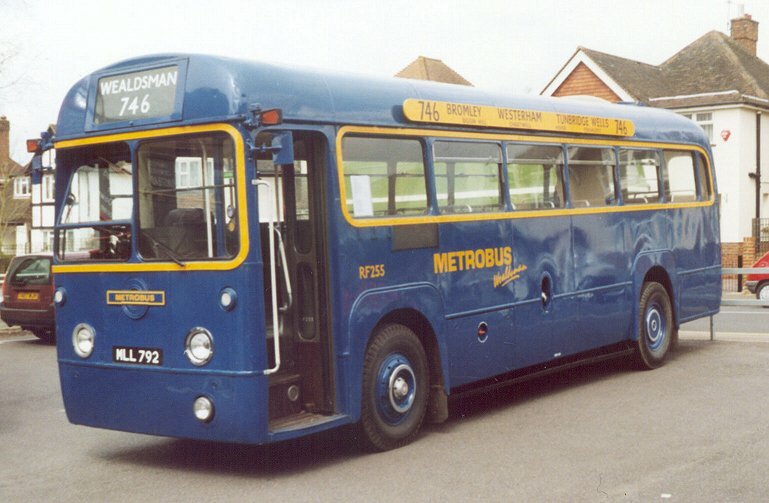 Also in the bus park was another type now history in Sussex (since Arriva's departure from Crawley): Metrobus M59. Other more middle-aged types were represented by Metroline London Northern's RML903, set up for a turn on the 409 to Forest Row, like the early red members of the main production batch of RMLs, and Leyland National SNB312 in NBC green with white band. 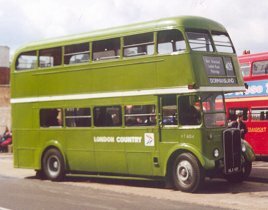 The latter had stood in for RLH48 after the low-height veteran had been impounded on its farm by foot and mouth problems, and had travelled in from Hemel Hempstead as a 708. 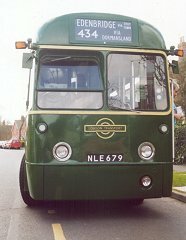 The Country Green RFs were still circulating, with RF672 in the park between 494 turns and RF626 passing through on a 434. 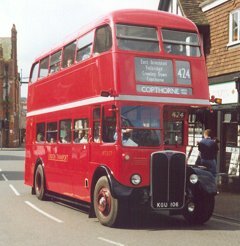 GS2 was heading for Edenbridge with a 485 working, and red RF489 was taking a turn on the local 428 circular service. I went for lunch aboard RM795. 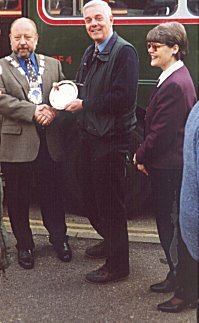 Thanks folks! 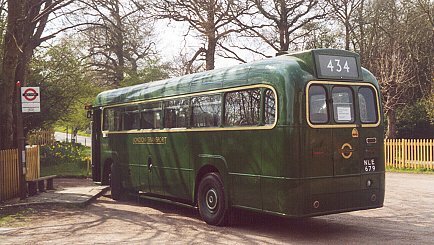 Mike was taking RF255 south to Sheffield Park for afternoon tours, and was not due back until after my service bus was due to depart. 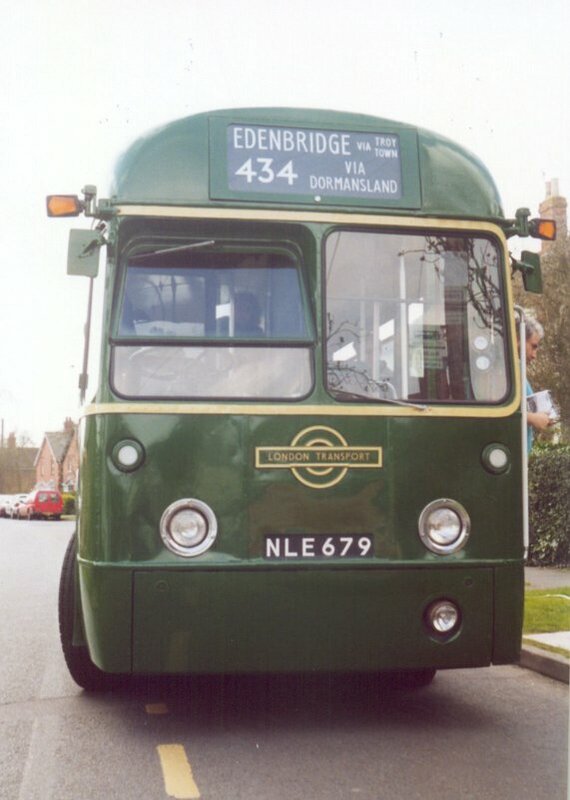 So I switched across to RF679, joining Colin Rivers and his team. 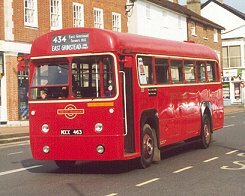 They had had a busy morning, having already completed an early run on the 485 from Westerham and a return 494 to and from Oxted Station. 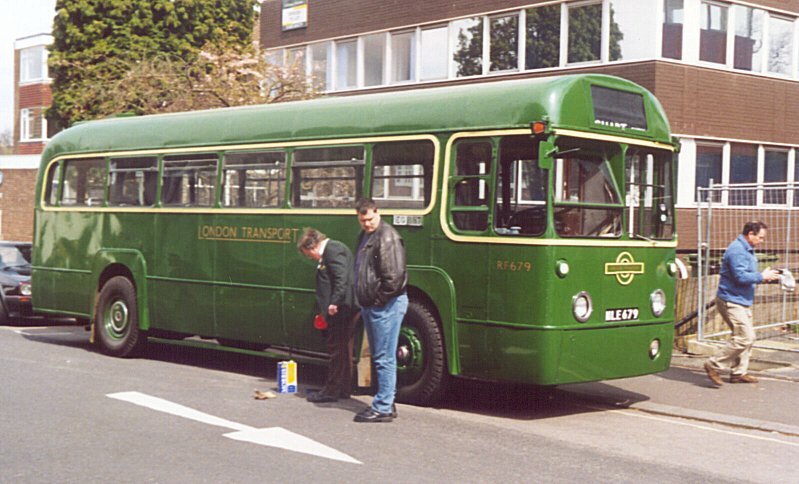 It was time to check the fuel, oil and water. 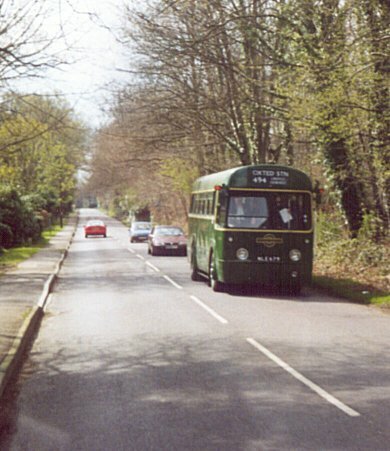 But there was little time to pause. 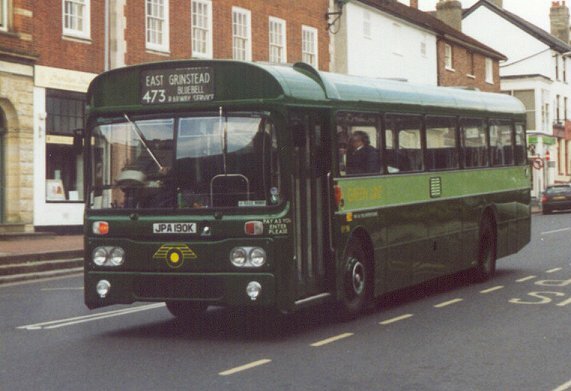 Very soon it was round onto the stand again, as a 434 to Kingscote Station. 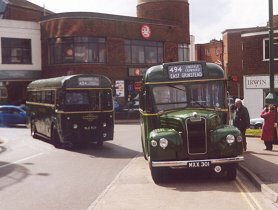 We collected a fair load, and trundled out of town and along the hilly route to the Bluebell Railway station. 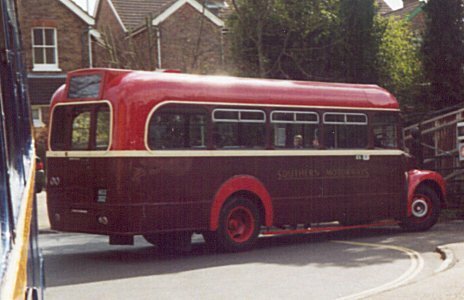 There was a sizeable crowd waiting, and we filled to full for the return to East Grinstead, and continued with many of the passengers on the run out to Dormansland and on to Edenbridge, over the border in Kent. 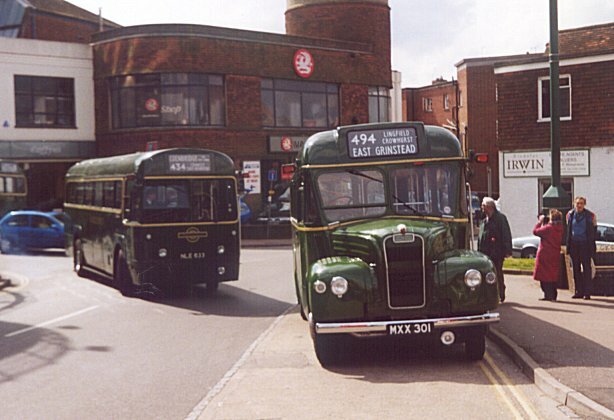 At the Star Inn we connected with RF633 on a 464/434 working, and left for the Troy Town loop as a green GS came scurrying up behind us on the 485. 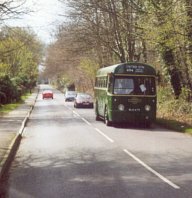 The loop was a new experience for most of the passengers, as we wandered off the main roads onto country lanes (still a route, now served by Metrobus) to small estates, terminating at Hilders Lane. 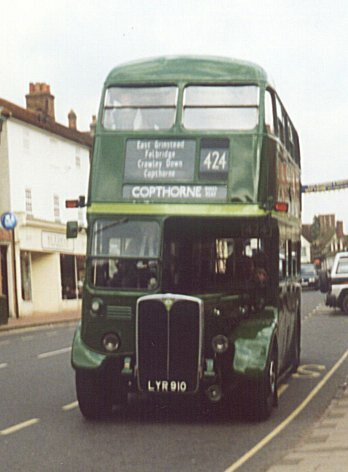 We paused there for pictures, before running back down the main road into Edenbridge. 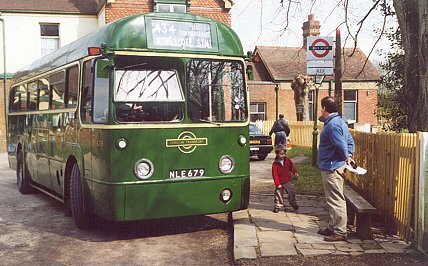 Some passengers changed onto the RT at Dormansland. We pressed on into East Grinstead, went round the bus station loop and headed once more for Kingscote. 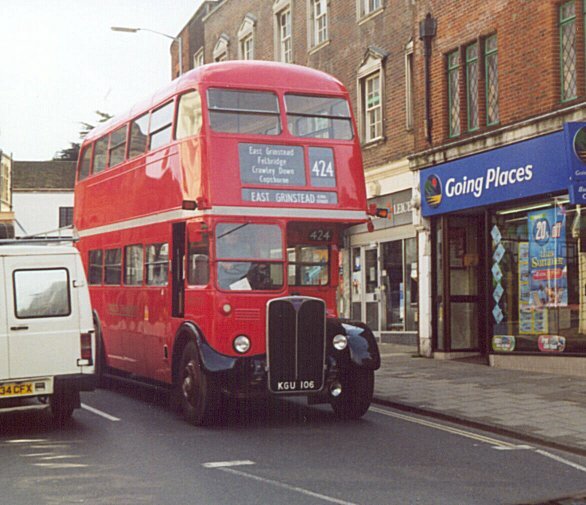 It was quieter there this time. 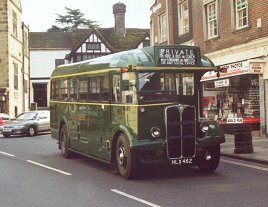 We had expected T792 to make an appearance for photos, but it had stayed behind at East Grinstead. 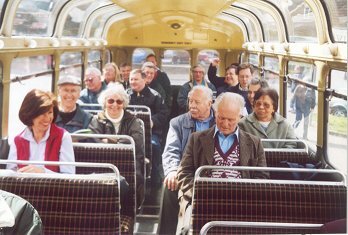 Passengers had enough time to have a look round before we headed back to town, passing RP90 on the 473 on the way. 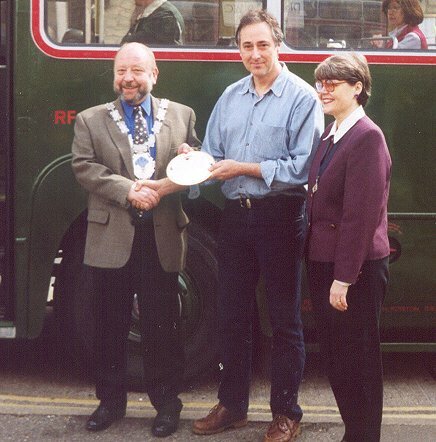 My time was up, as there was only a quarter-hour or so until my bus was due to leave. So I said good-bye, and set off for the war memorial. T792 now made its appearance from the carpark, and I saw it both in King Street and again on the High Street. 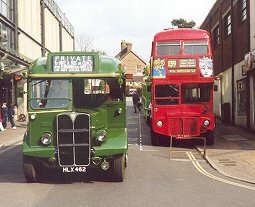 A continuous procession of buses passed me, still operating the day's intensive services. 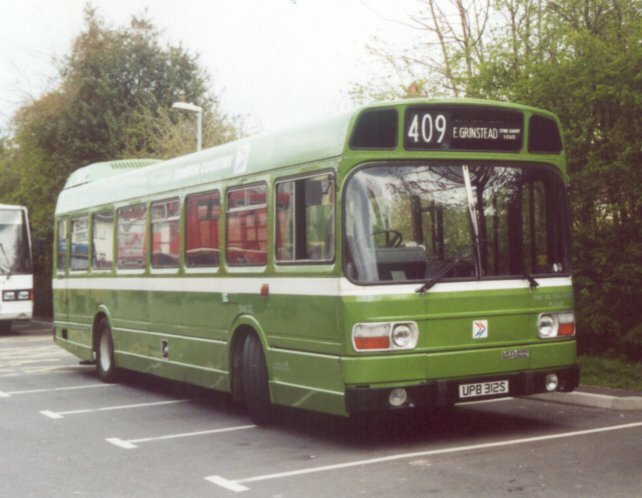 I saw red RF406 on a 428, red RF 421 on the 434, red RT2177 still on the 424, GreenLine RT3228 on a 708 Relief, GreenLine 3491 on the 424, NBC green RT604 on a 409, red RF486 and RF489 in quick succession on 434s, RP90 on the 473, green RF626 on 434, SNB 312 heading back to Hemel Hempstead, and blue RF255 coming back from Sheffield Park. 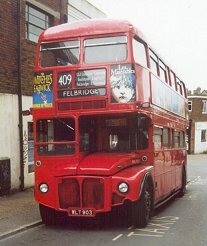 Visiting RM40, still in original LT red paint, was also departing. (All in a quarter-hour). 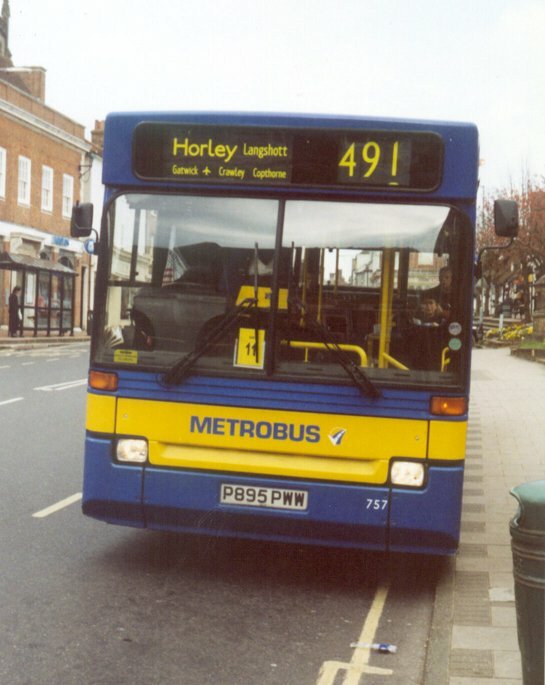 My bus arrived, Godstone's Dart 757 on Metrobus service 291 from Haywards Heath. 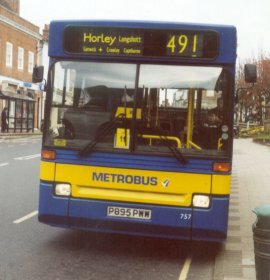 Having set down his terminating passengers the driver resolutely shut his doors against intending passengers until he had completed its transmogrification into a 491 to Horley, involving a long process with the onboard computer and a gallop through the front blind. 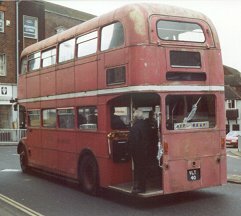 Then it was off to Crawley, first stage on a six-hour journey home. 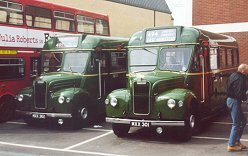 My thanks go to all who organised the day: those on the Country Bus Rallies group who planned the event, organised buses, drivers, timetables, duty rosters, parking, presentations, food vans..., especially Alan Charman, and also to the owners and drivers without whom there would be no event. 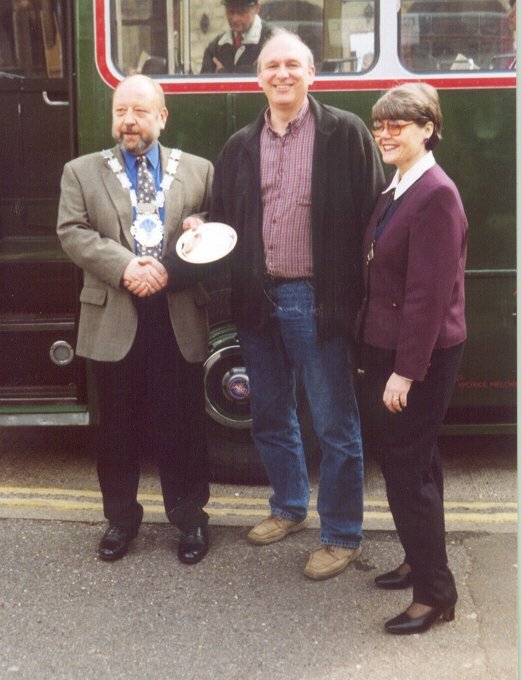 Thanks also to those who offered me hospitality on their vehicles, in particular Mike Dawes and Colin Rivers. 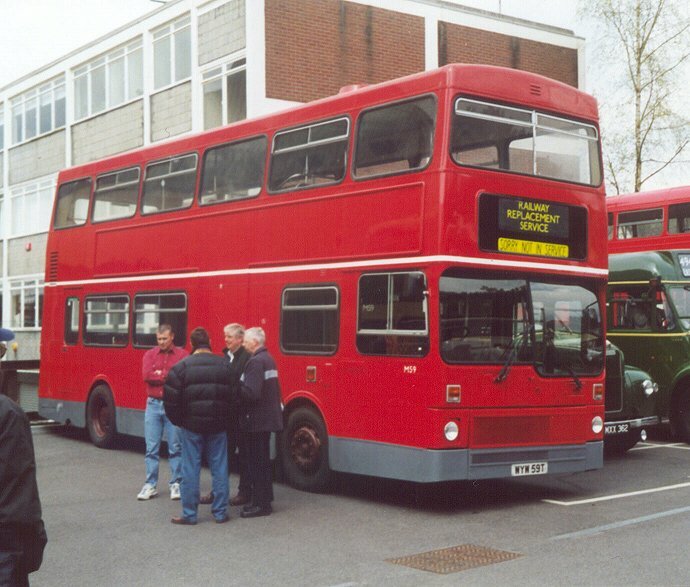 plus other visitors, including an Eastern National Bristol FLF, a Bristol RE, an East Kent Beadle(? 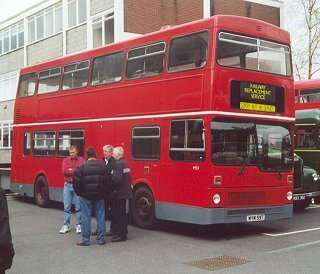 ), an M&D National, and a Southdown single-decker (none of which got much of my attention, I'm afraid). 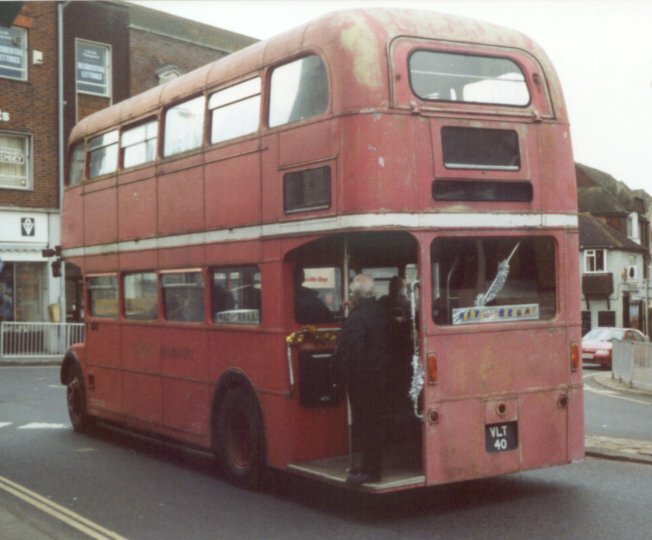 Back to Ian's Bus-stop Part 1: Arrivals Alan Charman's speeches?